Running a supermarket requires immense due diligence and even more patience. From inventory management to store security, managers have a lot on their plate. To streamline many of the business operations, you need an efficient point of sale system designed specifically for supermarkets. A robust supermarket POS system allows the cashier to ring up sales fast and efficiently. For example, the system should let the cashier enter the product name, item number, or even scan it. When the transaction is complete, the payment is automatically reconciled into your books. This means your store is already prepared come tax season. The best POS systems also aid in security for the store, keeping accurate stock to deter theft. By analyzing every transaction, you can account for every item you have. 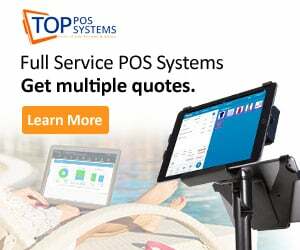 Picking the right POS system, however, can be tough. Fortunately for you, we’ve done hours of research to find the most ideal point of sale solutions for your supermarket business. We reviewed each system on features, pricing, and support. 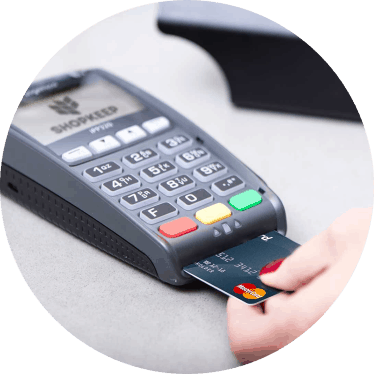 LS Retail has been developing market-leading POS systems for about two decades. Its POS software is used by retailers and restaurants all over the world. With their vast knowledge and experience in the retail and food-service industry, they can offer scalable solutions to manage complex operations in a wide array of areas. This includes industries like restaurants, coffee shops, c-stores and much more. However, LS Retail specializes in customizing solutions for supermarkets. Simplify your supermarket’s process, improve speed and productivity in your aisles and enjoy higher profit margins. Enhance the performance of your staff and you’ll be able to offer better customer service. With LS Retail, you’ll be able to even cut staff training time. This feature gives you entailed information from customer sales that can help manage inventory by finding the right product mix to meet sales goals and maximize revenue. It saves time and resources by setting an automatic replenishment of standard stock so that you do not run out of stock. The advanced inventory feature gives more mobility and productivity to staff. This ensures head office confidence, as stock databases are always up-to-date. Checkout speed and flexibility can be increased with our POS system. A copy of the database is available in all our solutions which provide maximum speed and resilience, regardless of how many POS are being operated at the same time. No loss of speed or accuracy will be experienced even in the peak hours of operation. Fast-paced operations will be assured at all times to satisfy consumers. Consumers will also be given the option of self-checkout. This POS System helps ensure increasing customer loyalty. The mobile app also lets customers create a list of the required items they want to purchase. The app entices them by sending customized offers, promotions, and coupons to their mobile that they can avail at the store. You can empower your sales associates by giving them access to the information of the POS interface. The supermarkets can distribute information about their products through their POS interface while giving their staff the tool to provide excellent customer service. The feature is available on tablets and stationary terminals. • Cut you checkout lines. DCR is an organization providing POS System to restaurants, supermarkets, and retail businesses. They act as a value-added system interrogator with their finest hardware and software vendors in the world to supply customer solutions. DCR is a partner with the leading POS software and hardware vendors providing complete software solutions, such as the LOC Store Management Suite, powerful platforms, scanners, scales, mobile devices from Casio, HP, Toshiba, Datalogic and much more, it has the solution to fit your needs. This is an all-in-one supermarket and grocery system that is designed to give maximum efficiency and profit margins to supermarkets. Their grocery store solution combines the latest hardware and the most powerful grocery software of the industry. The 24/7 hour customer service delivers the tools to independent grocers that need to compete and thrive in the fierce competition in today's markets. One way that this POS system is expressly designed for grocers is their integrated sign and label printing. In other words, you can print signs and labels for products directly through the POS. This prevents you from having to connect too many different programs. The automation and streamline of daily routine tasks and procedures help them focus on the bigger pictures and take into account what matters most, such as creating customer loyalty for years and enhancing their customer's experience. For example, most POS systems allow you to access your inventory and see what you are running out of. However, DCR allows you to see your inventory and make inventory orders all through the POS system! This is an incredible advantage compared to other POS systems. DCR believes that building customer loyalty and satisfaction is the most important factor in the success of any business. Thus to create everlasting customer loyalty and satisfaction, they have a variety of rewards programs and a versatile promotion engine. Their solutions provide supermarkets with the most complete, adaptable and sophisticated promotion toolsets in the industry, without any exception. Additionally, you can create any sales or keep track of gift card amounts in this POS. Not only that but if you have multiple locations, you can track all of this information in one place. DCR POS System lets you truly control and boost your profit margins by using powerful analytical tools and reports that gains insights into important key factors that directly impact the supermarket's bottom line. The main focus of IT Retail is to focus on developing grocery POS software and solutions on the Microsoft platform and that interface with Microsoft suite of products. They have solutions for Microsoft Windows NT, 2000, XP, SQL Server, Visual Basic, .NET and MS office. IT Retail develops, customizes, sells and retail service solutions to independent supermarket retail chains and retail operators. There are three tiers of IT Retail developed to cater to supermarkets. First is Retail Professional, built for grocery stores. Retail Enterprise is built to support large change. Finally, Retail Next was designed to support small grocers with only one store. It is the top selling product of IT Retail which includes grocery POS and back office management POS. This feature helps monitor employees. Track cashier's efficiency such as the average number of sales he's entering per hour, reports such as rings or minimum and more are all easily available and accessible by management. It manages the lanes with blind tills, and you can check which cashiers are over or are short. It helps you customize the roles for each employee according to the store’s needs. Retail Professional had a variety of reports that are useful in making important decisions for the store. Top management can view reports such as stores sales analysis, safe accounting, employee performance, product sales, customer purchasing patterns. You can also customize reports to your needs through the Microsoft SQL, which gives you the leverage of using store data into useful and actionable information. The back office POS system helps take the guesswork out of inventory management. You can easily keep track of inventory, costs, purchases made, product delivery and much more from the convenience of your store. You can also set target margins from the back end along, and you can set prices based on your own data analysis. This tool enables you to eventually cut costs, make smarter decisions and increase profit margins of the store. Through the Retail Professional Customer Relationship Marketing module, you can easily identify customer needs and better serve them. You can also see where the customer comes from, what products they buy and how much do they spend on average. Based on this information you can additionally send them personalized promotions and coupons. The Retail's back office lets you keep track of inventory from the item, cost and retail management to receiving inventory counts, profitability analysis, etc. It gives more detailed information about the product, category, and department analysis to have more clarity regarding cost, inventory management, and sales price. The store sales app is a companion to the Retail Professional that tracks store sales from your mobile phone. You can view the trend analysis over time and see customer traffic at your store. The Retail Professional’s add-on is a patented recognition software camera. This camera also links to the POS system that stops BOB loss by detecting items. These items may be under the cart or possibly hidden away from the cashier’s line of sight by other items on top. 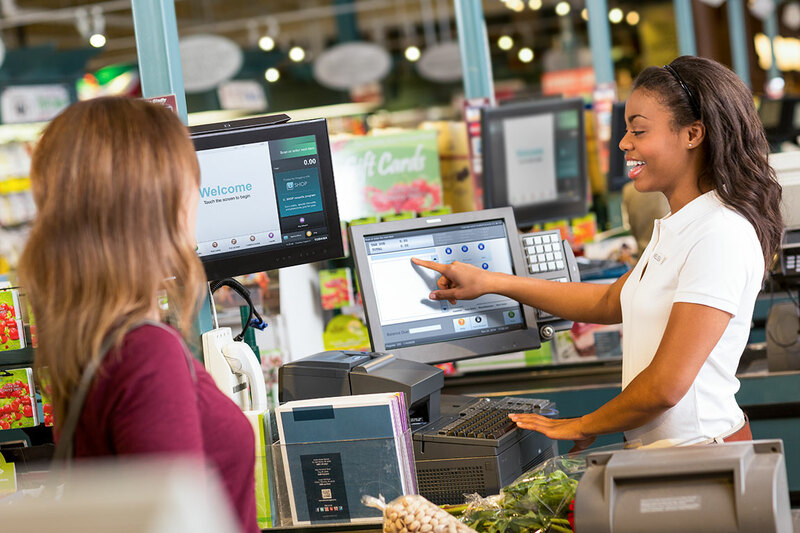 Retail Professional, along with Pan-Oston’s has developed a self-checkout solution that supports the creation of an innovative self-checkout system that focuses on keeping your grocery store on the cutting edge of the market. 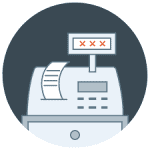 With Retail Enterprise, you can control pricing straight from your POS. This means that if you have multiple stores, you can set pricing for all of the stores with one click. The same goes for sales or for customer loyalty rewards. You can make sure these discounts apply to all or one of your stores. One of the best features of this POS is their customer options. You can create individualized customer accounts, and you can even add pictures to each customer's profile. This allows your employees to recognize them by name, adding a personalized touch. You can also customize their individual coupons, based on previous purchases. When you use this feature you make many customers feel valued. Like many POS systems, this POS will track everything in your inventory. You can set up your system to alert you when you are running low on items. This can help you keep your store stocked and enable you to keep customers satisfied. This is specially designed for small supermarkets that have a 1-5 lane check-out. Retail Next is completely cloud-based, which allows you to save money. You can also check your data from anywhere. You can use the processor of your own choice; work with Apple Pay Samsung or Android Pay or Cash. Additionally, this lets your customers choose their desired payment method. Add products, change prices, push changes all through your device anywhere. Retail Next speed up and simplifies your check-out process, reduces customer lines and wait times. This POS also provides full scanner and scale integration, powerful receiving, inventory management tools and label printing. Retail Next can meet all your grocery needs. Supermarkets customers have very high expectations. As you know, they want to experience welcoming surroundings, a variety of products, good deals, and much more. In a smaller city, you may also face much competition. This is why you need to stand out from the crowd and manage your daily operations successfully while increasing your sales. Not only that, you should have a POS system that is easy to use and automates your business operations. Streamline the routine tasks and focus on the things that matter, like employee scheduling and customer service. Building customer loyalty should be a top priority. We strongly recommend LS Retail if you want to give your customers a seamless checkout experience, where they go from shopping to taking groceries home in no time. No matter if you are a small convenience store or a supermarket chain, LS Retail will help you maximize efficiency. Also, speed up your service and minimize costs at the same time. The second best option is the IT retail POS system. If you are a large or medium-sized supermarket, Retail Professional is the best option for you. If you are a small sized supermarket, then this is the solution to your problems. At least, IT Retail allows you manage your orders and inventory from a single dashboard. What's important to you when it comes to supermarket software? Comment below!